I want to tell you about a meeting that we had in La Realidad a few days ago. 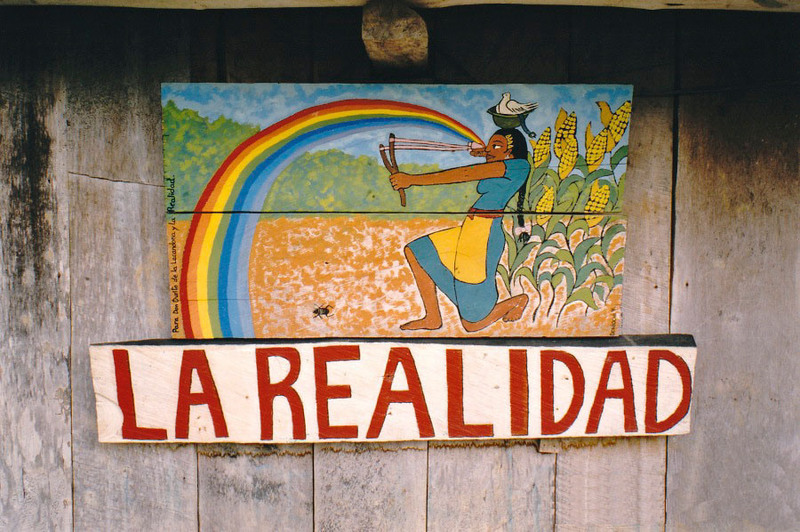 The Zapatista compañeras and compañeros of La Realidad say that the three levels of capitalist governments who destroyed their autonomous school, autonomous clinic, and the hose that brings water to the compañeras and compañeros wanted to destroy the Zapatista struggle then and there. It should not be forgotten that when the first Aguascalientes was destroyed, the Zapatistas built five more. It has not been forgotten that the humble houses of the autonomous authorities of the Autonomous Zapatista Municipality in Rebellion (MAREZ) of Tierra y Libertad in 1998 and the MAREZ autonomous headquarters of Ricardo Flores Magón in the caracol of Garrucha were destroyed by Roberto Albores “Croquetas,” when he was governor of poor Chiapas—poor because of the bad governments. But the MAREZ continue their path, and are even stronger now. It should not be forgotten that we Zapatistas said: with or without the government, we will carry out our autonomy, our indigenous rights and culture. All of the political parties and all of the branches of government -legislative, executive, and judicial- told us to go to hell, thinking that with that the seed would not germinate. On the contrary, it grew, became strong, and is present in the actions and practice of the Zapatista communities themselves, where the people rule and the government obeys. The compañeros bases of support in La Realidad said they would rebuild their school and clinic with the materials that nature provides. So I said to the compañeros of La Realidad: let me write to the compas of the Sixth in Mexico and the world. And so that the compañeros would understand why, I explained: what if we are accused of environmental destruction? Because we would need to cut down trees for wood and use palm for the roof, and the capitalist governments say that they are the ones protecting the environment. And then I thought: Now why did I say that. They begin a list of instances of forest destruction by lumber companies who have permission from the bad governments of Chiapas and of Mexico. Pirate lumber companies, the compas say, though legal in the governments’ eyes, because they themselves are behind them. The wood is purchased in parts, or pieces, says one guy, Salomón, from Las Margaritas. They buy them as planks, slabs, and joists. People from the ejidos of Momón, San Francisco, Vicente Guerrero, La Victoria, Pachán, and the Ejido Tabasco, all in the municipality of Las Margaritas, sell them. Also from San Miguel and Carmen Pataté, in the municipality of Ocosingo, and all over Chiapas. In order to calm the discussion that was generated by my comment that, “the capitalist governments will blame us for environmental destruction,” I tell the compañeros and compañeras that we could take care of this problem if I write to the compas of the Sixth in Mexico and the world; maybe they can organize themselves and get ahold of some money to buy materials. And the bases of support answer me—well, this isn’t going to be the end of the problem—and say: okay compañero, write them and we’ll wait and see what they can get together. “Jeez! That we don’t know,” they say. “One fourth and a little bit,” and he counts using the fingers on both hands. “Yes, I have the number. For a two-story building, 19 meters by 7 meters wide, that is 19×7, we’ll need: 2000 cement blocks, 50 half metal rods, 400 metal rods of three-eights length, 60 sacks of lime, 520 sacks of cement, 100 kilograms of mooring wire, 400 kilos of wire rod, and 84 sheets of galvanized metal 3 meters in length. The total comes to $200,209 [Mexican pesos]. Two hundred thousand two hundred nine pesos. The bottom floor should be for the children’s school, and the top for the clinic. This is in order to use the space well. This is only for the buildings. That’s not counting the health equipment, the thermometer, Baumanometer (to measure blood pressure), Otoscope, etc., and also the medicine. Well ,compas of the Sixth, that is what I wanted to tell you. You see if you are able to gather any money together. In the twentieth year of the war against oblivion.